Choosing a parang can be a bit bewildering for someone new to the jungle as there is a wide range of different types of parangs out there, and then there are the large bladed knives as well. Ideally one should test a parang first to see how it feels, whether it fits your hand and is the right weight and length, however many of us order on-line where the only reference is a picture and the testimonials of previous customers. So in this video I try to give some guidelines of what I look for in a parang and answer some of the FAQs that have been sent to me about parangs, particularly how they perform vs large bladed, Bowie style knives and where to source a good Malaysian parang. The other point I am trying to reinforce is that the type of parang you need is dependent on both how you treat it and and what you use it for. This confuses a lot of people who are persuaded to by overly heavy duty and weighty combat style machetes when they really don’t need such a heavy and cumbersome piece of kit. The trick is to learn to use the parang so that it takes as little effort as possible and to always try to find easier ways to do difficult tasks. At the end of the video I demonstrate an example of this but there are many more: e.g. processing large logs of wood for the fire doesn’t have to be done by lots of parang chopping, there are easier ways; the most obvious being to simply burn through the middle of log, which takes no effort on your part whatsoever. For those interested in buying the Malaysian parang (called ‘MY Parang’) that Outdoordynamics are producing. here are the links to both their website and Ray Mears’ site where you can purchase one. I’m not affiliated with either company and I paid for the MY Parang I tested myself. And here is a link to more detailed field testing of the My Parang at the Outdoordynamic Youtube channel. It is easy to look at the standard, off-the-shelf Malaysian parang and mistake design evolution for flaws. 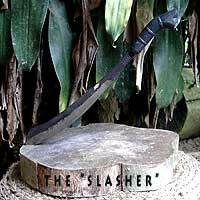 Someone new to the jungle might quickly draw up a list of its failings and mentally redesign the parang into something heavier, full tanged, stainless steel bladed with off-the-scale rockwell hardness; ending up with something more in common with an axe. I’ve seen some survival knives that have gone this route, some are even designed for two handed wielding (!) and are heavy enough to fell an ox….but I’ve never had the need to fell an ox, or wield a parang two handed. The main task a parang is used for, in the jungle at least, is cutting green vegetation and the hardest task I put it to is cutting dead bamboo. If I need to split heavy logs for firewood than I use gluts. So why over design something for a purpose is shouldn’t be put to in the first place? 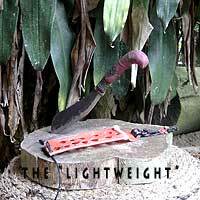 The parang is made of carbon steel and, in the humidity of the jungle, will rust. So why not go with stainless steel? But here’s the thing, rust is on the surface only and can be easily taken off, so it’s not such a big problem particularly if the parang is in daily use. Also, carbon steel is easier to sharpen than stainless steel. Similarly a very hard edge to the parang is not as advantageous as it might at first appear as it would make sharpening the parang more difficult. Which brings us to rat tail tangs – these appear to be a design flaw but have advantages that a full tang does not. A rat tail tang means that the parang is more forward weighted and also reduces the shock waves coming up through the parang when you’re chopping. But, perhaps more importantly, a rat tail tang means that you can fix (or attach a new) handle very easily in the field….something that it is far more difficult to do with a full tanged blade. The belief that a heavier bladed parang is superior to a lighter blade is also not necessarily the case. As an analogy, imagine trying to play badminton with a tennis racket and you’ll get the idea. The parang is used with a lot of wrist movement and, if it is too heavy, your wrist will get tired fast. When I first started using a parang here in Malaysia I suffered from the same (slightly arrogant) assumption that I knew better and that there were ‘obvious’ flaws in the local parangs my Malay friends were using (which, for me, were the lack of retaining pins and the use of the rat tail tang). Years later and I can see the advantages that these supposed flaws offer and the problem that I imagined (i.e. the blade coming out of the handle) was not such a huge problem as it is so easy to fix should it happen. Of course, you may be thinking, the idea of a blade flying out of the handle (due to the lack of retaining pin) is a bit scary however, when it happened to me, the blade came out with the force of the downward chop and didn’t altogether leave the handle so it’s perhaps not quite as bad as you might think. …saying that, I still keep my distance when following behind anyone swinging a parang just in case the blade does fly out, or (and this is more common) the handle slips out of the person’s hand. All this is not to say that retaining pins, stainless steel, full tangs etc are necessarily ‘bad’, rather that the Malaysian parang design has some intrinsic benefits to someone in the field as long as you know how to take advantage of them. You can spend a lot of time (and money) looking for the ‘ideal’ piece of kit when all that is needed is to modify an ‘off-the-shelf’ product instead. If you have a well equipped workshop and a sewing machine there isn’t much camping equipment that you can’t improve on or customize to your particular requirements. However, not everyone has the tools that are needed and to go out and buy them specifically for a single project can make any cost saving quickly disappear. Last year OGM (Outdoor Gear Malaysia) opened up a workshop at their retail outlet in Subang so that their customers could modify equipment for themselves. I think this is a great idea as it means that anyone now has access to the tools and machines needed for customization projects and can get advice and guidance from the staff at OGM if they run into problems. I decided to test out the concept with an old parang I had lying around: I wanted to put a wood handle on and make a sheath for the parang. The first stage was to get the handle made. Stem, an Orang Asli living in Bera, is a craftsmen whose carving abilities far exceed my own so I decided to get him to do the handle. Alternatively you can simply buy an ‘off-the-shelf’ wooden handle for around RM10 but the advantages of having one made are that 1) it will fit the tang of your parang correctly and 2) you can specify how you want the handle shaped. If you want a customized handle made by Stem the cost is around RM30 and OGM can arrange for this (it will take about a month or so). The next stage was to fit retaining pins – this can be quite tricky with the narrow, rat-tail tang of most Malaysian parangs and a bench drill is a huge help (vs trying to use a handheld drill). Keong, at OGM, has fitted retaining pins so often it is second nature to him and a task that can be difficult and time consuming was completed in less than 20 minutes. Once the pins are made and holes drilled you can epoxy the whole lot together at your leisure. I also wanted to try out a Kydex sheath for this parang. Kydex is expensive stuff RM 80 (for black) – RM 180 (for cammo) for a 2 by 1 foot sheet but the end result is a sheath that looks as good as a commercially made injection moulded sheath. Kydex is very easy stuff to work with and you could simply buy a sheet, take it home, and do-it-yourself. If you’d rather have OGM make if for you they can do this (for a fee of around RM45). All in all the cost of this parang project was (roughly): parang (RM 25), handle (RM 30), Kydex, eyelets, screws (RM 100), OGM fee (RM45) = RM 190 (= approx USD 60). The best parang … ever? Because junglecraft is so reliant on the parang, it is not surprising that people want the very best parang they can buy to take into the jungle. But the truth is that the ‘best’ parang depends on what it is you’re trying to do with it. For example, a sledge hammer is a very tiring tool to use if all you’re trying to do is bang in a few thumb tacks, similarly a heavy parang is tiring to use if you’re just going to use it for light trail clearing. In this video I review some of the parangs that I’ve found myself using most in the last 12 months and what it is I like about them. Below is a checklist of some of the things to consider when choosing a parang. I like a simple, curved handle that allows some rotational movement in the hand – you may need to reshape a handle to fit your hand because, if it doesn’t, you’ll quickly get blisters. I would avoid an over-shaped (or square) handle with finger grooves (e.g. Gerber’s Bear Grylls parang) as this will make your parang technique stiff and awkward (and give you blisters). There is a reason axe handles don’t have finger grooves carved into them and the same applies to a parang handle…you want to allow some (controlled) movement of the parang handle within your hand as you swipe. I would also avoid parangs with lanyards (or remove the lanyard from ones that do) – some people advocate using a lanyard to secure the parang to your wrist in the event that it slips out of your hand. This seems a bit risky to me – if I let go of the parang mid-strike I want it to go away from me and not have a large, sharp blade swing back around on me like something on a colliding orbit around my wrist. Whenever you use a parang you should have a safe follow through so that, should the parang slip out of your grip, it safely flies away from you anyway. And traveling companions should also stand well clear and make sure they are not in line with the parang. This depends on what you are using the parang for, generally speaking, the long bladed parangs are used for slashing through dense undergrowth that you find in secondary jungles. I try to avoid secondary jungles as they are not nice to travel through and, in primary jungle, there is much less need to slash your way forward (and therefore less need for a long blade length). If you are starting out, a 10 inch blade is a good way to go and the length I prefer for general use. Most Malaysian parangs have a rat-tail tang. I suspect this is because parangs were traditionally banged into the wood block used to form the handle and a sharp point was therefore necessary. However, I am not sure why the rat-tail tang is also used with the plastic moulded handles and I would rather they used a heftier (or full) tang with stronger securing pins. Some people say that a full tang has a negative effect on the forward balance of the parang…maybe this is true, but I still think the plastic handled parangs would benefit from a slightly beefed up tang. If the parang you buy is a wooden ‘authentic’ type it probably won’t have a securing pin to hold the tang in the handle. If it doesn’t, put one in… better still put in two as this stops the tang rotating (which it can around a single pin) and working itself loose within the handle. I can’t tell you the Rockwell hardness of the parangs I use here but my observation is that the blades are not that hard and are easily ‘dinged’ if you hit a stone or with heavy use. The thing is, this isn’t a problem – because the blade is ‘soft’ it is extremely easy and quick to sharpen and reprofile and you quickly get into the routine of frequently restoring the edge on your parang. Heavier parangs chop better than light ones but are more tiring to use for light clearing on the trail. It’s nice to have a parang that looks good, and there’s nothing wrong with that. But using a plastic sheath instead of wooden one is going to reduce weight so it depends on how weight conscious you are. On day trips I like to take along the Duku Chandong because weight isn’t a major factor, but on longer trips I use a more lightweight option. With the bigger parangs I find a second, small blade well worth the extra weight. My favourite is the ridiculously good value Mora 511. So…. is there a ‘best’ parang ever? The simple answer is that there may be a best parang for a given task but, the more tasks a parang is designed for (e.g. slashing and chopping and clearing and whittling etc) the more compromised it’ll be and the less good it’ll become at any one of those individual tasks. Amongst the earlier videos I’ve covered most of the main cutting techniques used with a parang, but I thought it would be useful to put them all together in this one video. 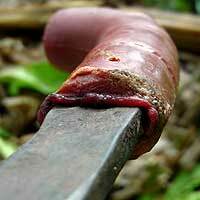 Although the parang can be used for intricate carving, given the choice I would use a small Mora knife instead. There are two reasons for this: 1) my Mora is always razor sharp (but my parang sometimes isn’t) and 2) it is simply easier to control a small light knife than it is to control a parang. If you are taking in a Mora I would suggest taking a thin balded, carbon steel, Scandi grind model. I like the one I’m using in the video which has a hand guard and a very thin and extremely sharp blade. This model is the Mora 511 and you can pick one up in the UK for around 6 pounds (astonishingly good value!). 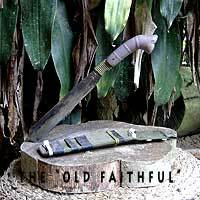 I would recommend avoiding the thicker bladed bushcraft knives as, for any heavy work, you will simply use the parang instead. I’ve also covered the two-stick bow drill method towards the end of this video as I had left it out of the advanced bow drill techniques video I did earlier. An easy to way to tell if someone is new to using a parang is that they tend to over use it: clearing brush that could simply be pushed through or chopping wood that could more easily be broken or burnt through… and generally putting too much effort into each cut they make. The trick is to use the parang only when you really need to and, even then, try to make the weight of the parang do the work for you, keeping your arm and wrist relaxed. 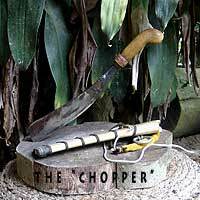 If you are new to using a parang and want to get this primal desire to chop everything-in-sight out of your system then start by chopping through a fallen tree trunk….after 10 minutes or so, your wrist will be tired, your arm will ache and your hand will be blistered…and, magically, that desire to ‘chop stuff’ will have evaporated. Saying that, there are times (particularly when collecting firewood) when it is necessary to chop through thick sections of dead wood and, if the outside of the wood is wet, split it down into decent firewood. These are times when I often wish I had a saw with me and a small folding saw is an item of kit you may wish to bring along. However, assuming you only have a parang, how can you use it when dealing with larger sections of dead wood? I often see people trying to split large pieces of wood using only the parang and a baton: with smaller pieces this is fine, but with larger sections it is the hard way to do it as the parang will jam in (and not split the wood) and your baton will get torn to pieces on the thin spine of the parang. In the video below I show how to use wedges (gluts) to split down large trunks/limbs into manageable sections. Using wedges makes an enormous difference – less effort is required, less aggravation is involved and it’s much quicker. …once the wood is split down, it can be easily snapped in half, feather sticks can be made and the split pieces of wood will catch fire with much greater ease than if it is left in one piece. A number of people have written in asking where they can buy Malaysian parangs if they’re not in Malaysia – as they want to try them out in their native countries – and why not? I don’t see any reason why parangs should be limited to use in the jungle as they’re such versatile tools. I suggested trying the Condor Golok (www.condortk.com), however, although I’ve heard good things about them, I’ve never used one myself so I felt a bit uneasy suggesting them. You can also visit his website at www.outdoordynamics.com.my to see the range he carries. While I was looking as his website I saw that he also carries the duku candong (pronounced ‘chandong’) which is the parang style favoured by Ray Mears and one I’ve wanted to try out for some time. The video below is a review of this parang. …so this parang is very nice to use and seems to have a well made blade. The cost is just under 30 UK pounds. Of course, with anything hand-made like this, the quality can vary and there is no guarantee that every blade will be the same standard or made from the same metal. I haven’t put in retaining pins for the moment as I want to wait and see how long it takes before the tang works loose in the handle. Would I buy one of these instead of the (much) cheaper standard parangs? Well, I did so the answer is clearly ‘yes’! – however I’m glad it wasn’t the first parang I ever bought as you don’t want to go through the learning curve (i.e. getting your sharpening technique right, learning to avoid ‘dinging’ the blade etc) with an expensive parang. Does it make cutting easier? Again, ‘yes’, it does – but having a good technique makes far more difference than having a ‘better’ parang. For him, I suspect, the parang is simply a tool and, as long as it does the job, he isn’t going to spend any more than he has to on a better one. Anyway, to sum up, I do like this duku candong parang style and it seems that Ray Mears has the same good taste in parangs that he has shown in other types of kit he uses. I am sure he is someone who chooses his gear with great care and, as a general rule, if you are unsure of what kit to buy, his choices are always a good steer. 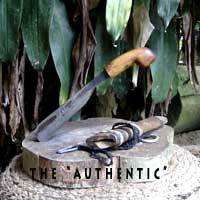 Any knife or parang is, at its most basic, simply a piece of sharpened metal with a handle. If you want a bushcraft knife you don’t need to spend hundreds of pounds on a Woodlore knife – go and buy a blank blade and fit a handle on yourself. It’s a much, much cheaper option, fun to do and you’ll have something that you made yourself and stamped your own character on. If I was forced to choose between this new parang and the one I made (with the wooden handle and sheath), I’d choose the latter. Not because it is better, but because they both do the same thing and the one I made is…well, just that, one I made. To wrap up this section on parangs I’m going to quickly review the options already covered and, in the video below, show you another option that requires a bit more time, expense and forward planning but is one you might want to consider. This is about as basic as you can get but, if you’re as skilled in junglecraft as the Orang Asli, it’s arguably all you need. I like this set up, but I am having to restrain myself from drilling through the handle and putting in a retaining pin! Time will tell how well the handle holds with heavy use. This is a budget option and, with this in mind, I have replaced the Falkniven sharpening stone with an old mill file to keep the cost down. All the items used could be sourced locally when you arrive. This is the parang/sheath set-up in the video. It is the most expensive option and you would need to buy some items before leaving for Malaysia (Falkniven sharpening stone/Mora clipper/Frog bayonet sheath) – however it means that you can set up the sheath before you leave (and include any survival items you want) and simply buy the parang when you arrive. With this parang I have added an extra, more robust, retaining pin to the existing one. To do this you’d need to find someone who will lend you a drill when you arrive (and you’d also need some epoxy resin). Two blades are better than one! As with most equipment, different options have different sets of pros and cons and the best option for you will be determined by your own personal preference, jungle skills, budget and the type of trip you are planning. The final stage of finishing the wooden sheath required some rattan-work, so I thought I’d do an introductory video (below) on how to split rattan and include the simpan knot (which is used to bind the two halves of the sheath together). The longest rattan is rattan manau (the record being 170 metres in length) and, when Baha was a young man, he would harvest this rattan from the jungle. 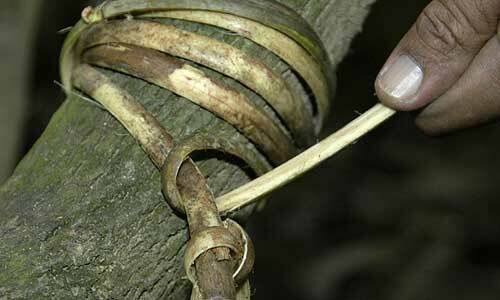 It’s a risky business because the skill is to cut the rattan as high up in the canopy as possible (the rattan stabilises itself by hooking onto nearby trees as it grows, but its own stem is not rigid). The bravest in the party will climb up the rattan stem itself until he’s as high as he dares (maybe hundred feet up) and will then start to cut the rattan stem above him. The idea is to cut though as much of the stem as you can without actually severing the rattan itself, then climb back down to earth and twist the rattan to make the break above where it’s been weakened. But, if you cut too much of the stem you are holding onto, it will plunge to the ground with you hanging onto it! It’s the jungle version of Russian Roulette and the unlucky ones who cut too far often die as a result. The wooden sheath took longer to make than anticipated, but I’m glad I did it – there’s always something nice about having equipment you’ve made for yourself and the wooden handle just feels… right. The question now is whether the handle will hold the parang blade in or not….time will tell! In this video I’ve finished off the long parang; putting on a rubber grip and adding some survival items to the handle. The mention of ‘survival items’ may conjure up images of gun-crazed survivalists preparing to fend off the zombie apocalypse, and many people may think carrying such items is over cautious. Is it over cautious? The truth is that although the jungle can be a hostile environment, it is not the hardest one in which to survive. Why is this? Firstly you’ll be near the equator (so you’re unlikely to die of hypothermia), secondly there’s usually plenty of water around (dehydration shouldn’t be a problem) and thirdly, well, it takes weeks to die of starvation. So why the survival items? With the items I carry with me I am confident that I can build a waterproof shelter, make a hammock to lift me off the ground, start a fire and find clean water… and that I can do all of these things relatively quickly. So, if I have to spend an unplanned night in the jungle, I am fairly relaxed about it and, although I may go to bed hungry, at least I’ll be comfortable. Having a relaxed approach to a unplanned situation is psychologically important as it means you’re more likely to think clearly and make the right decisions. If I’m lost in the jungle and it gets to about 4pm, I’ll stop and make a shelter/fire/hammock, get a good nights sleep and try to find my way out the next morning with a full day in front of me. A few years ago two people I know went into the jungle near to where I live and got lost. They’d driven to the end of the tarmac and walked less than 1/2 km along the route for a planned road extension. They’d walked this route many times before so they felt confident of finding their way out and they’d left their mobile phones in the car and didn’t have a parang with them. They got turned around and couldn’t find their way back to the car (this was mid-afternoon). Their frustration grew (they kept coming back to the same tree) as did a desire to get-the-hell-out of the jungle, so they decided to walk a considerable distance across a valley in their attempt to find the road. Unfortunately they were walking in the wrong direction. Later that evening the alarm was raised and their car was found. The surrounding area was searched but their was no sign of the two missing people. They were found mid-morning the next day (far from where they originally got lost) having spent an extremely uncomfortable night sitting on the jungle floor leaning against a tree trunk (much to the delight of nearby mosquitoes and leeches). People tend to make the wrong decisions when things go wrong – they panic – whereas being confident in the environment you’re in makes it more likely that you’ll stay calm and think clearly. Imagine if you’re super-rich and get stranded in a foreign city – no problem, you just check into the best hotel there is and all is well. But if you have no money, getting stranded in a foreign city is no joke. In this analogy, having a parang and a few basic survival items (and the knowledge of how to use them) in the jungle is equivalent to being super-rich in a city. …and talking of money, the parang and all the modifications only cost about 7 UK pounds (excluding the sharpening stone which cost around 15 UK pounds).